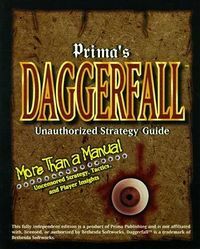 Prima's Daggerfall Unauthorized Strategy Guide is an unofficial guide to TES II: Daggerfall, written by Edward Carmien and published independently by Prima Games in 1996 as part of their Secrets of the Games series of strategy guides. It contains "uncensored" strategies, tactics, tips and player insights. "As the Emperor's champion, the fate of Daggerfall(tm) and the entire realm of Tamriel is resting on your shoulders. Can you sort through the dark treachery, the tales of madness and unrequited love, and determine the rightful heir to an ancient power of incredible proportions? Or are you orc bait? It's about time you learned the secrets of: fighting the new menagerie of monsters; customizing your own character; mastering the nuances of everyday life, from politics to skull-cracking; creating the most powerful spells-and using them in unusual ways; dungeon crawling, questing, and more! Daggerfall(tm) Unofficial Game Secrets. It's the difference between the sweet taste of victory and dining on cold steel." This page was last modified on 5 March 2019, at 08:57.